My post earlier today featured Ravi Shankar, who was born on April 7, 1920. 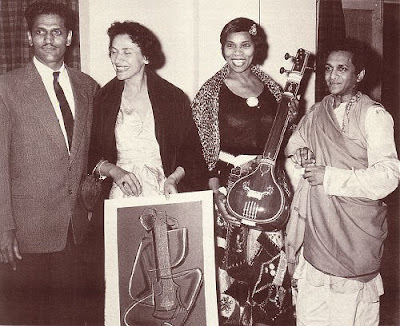 The photo above shows Ravi Shankar on the right, with next to him Marian Anderson, the American contralto. Marian Anderson died on April 8, 1993. Alex Ross has an appreciation. Sample the essence of India here. Vanessa Lann reminds me that I should also have mentioned Richard Power's novel The Time of Our Singing which is about music and race, and which features Marian Anderson's 1939 Washington concert.